When selecting fluorescent proteins (FPs), it is standard practice to select FPs with the highest in vitro brightness. However, it is well-known that in vitro brightness does not correlate well with the observed FP fluorescence signal in growing cells. 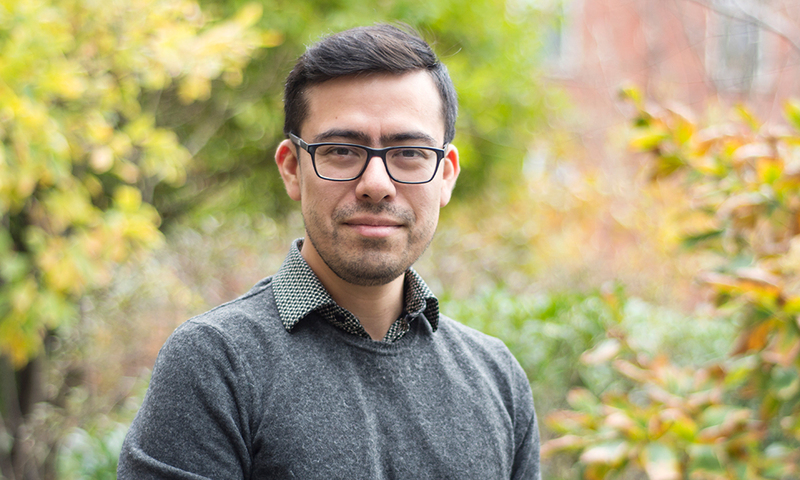 In this work, we find that FP maturation time is often the main feature governing the apparent brightness in living cells. FPs suffer of delays in maturation that affect all experiments where the precise timing of molecular events is crucial. Less recognized but equally important is the fact that maturation delays directly affect the apparent brightness of FPs in growing cells because delays are stochastic. Therefore, when a cell produces a burst of immature or “dark” FPs, every protein will experience a random delay before becoming fluorescent. The delays are distributed around the mean maturation time and their dispersion is approximately proportional to the maturation time itself. Thus, the longer the maturation time the broader the distribution of delays. This unavoidable physical effect has the unwanted consequence of spreading, throughout a broad time window, the fluorescence signal of an otherwise focused event in time. This work (PDF) shows that distributed delays are detrimental to fluorescence time-lapse microscopy because the technique relies on detecting “significant” changes in fluorescence between successive frames. Recording a burst of slow maturing proteins means that changes will be minute between frames and probably undistinguishable from spurious background fluctuations. By contrast, a burst of fast FPs might mature completely between frames thus giving the impression that a cell suddenly became fluorescent. We also show that maturation delays specially affect the fluorescence signal of fast dividing organisms. If the FPs are slow maturing, few proteins produced within a mother cell will become fluorescent; the rest will mature in the daughter, granddaughter and the descendant cells. 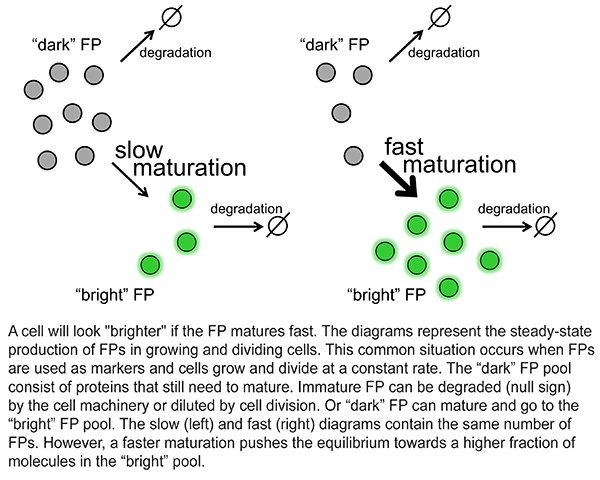 Thus, in fast dividing organisms, maturation has the net effect of decreasing fluorescence signal because there will always be a fraction of “dark” FPs. We show that in order to explain the observed signal of cells expressing different FPs it is essential to consider the in vitro brightness weighted with the expected fraction of fluorescent or “bright” FPs dictated by the maturation time. 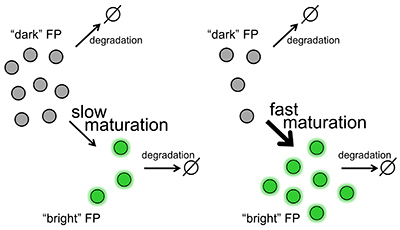 By contrast, ignoring maturation effects brings us back to the well-known and puzzling situation in which in vitro brightness does not correlate with the observed FP fluorescence signal. Using a novel single-cell chemostat, we characterized in living cells the maturation time of 50 popular FPs, with colors ranging from cyans to far-reds. We found that amino acids flanking the chromophore greatly modulate the time required for an FP to become fluorescent. “Right” mutations can accelerate the maturation process down to a few minutes whereas “wrong” mutations can slow it down to several days. Interestingly, the modulation seems to come from the very first steps in the chromophore-forming process. Contrary to the standard assumption that the oxidation step is rate limiting in FP maturation, it seems that the bottleneck are the initial torsional rearrangements of the flanking side-chains that bring into the right geometry the soon-to-be chromophore. 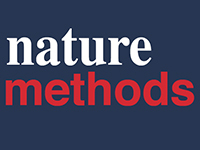 We hope that this work will serve as a reference for selecting fluorescent proteins and that it will be a convincing demonstration of the importance of fast maturing FPs for quantitative evaluation of rapid cellular processes.